The Mustang after a Frontal Offset Impact test that takes place at 64 kph (40 mph) with 40 percent of the car's striking a deformable barrier. 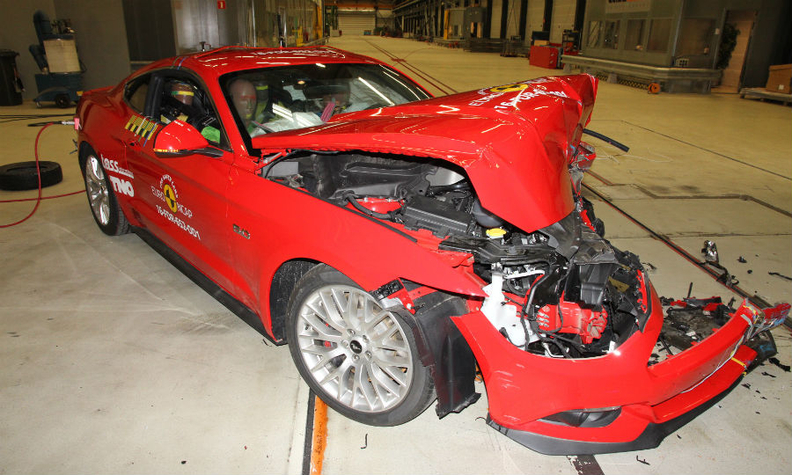 LONDON -- Ford Motor was criticized by the Euro NCAP safety organization after its Mustang sports car scored two stars out of a maximum of five in crash tests. "Ford did not expect Euro NCAP to test the Mustang and chose not to fit safety technology which is available to its American consumers," Euro NCAP Secretary General Michiel van Ratingen said in a statement. Mustangs sold in Europe are not equipped with automatic emergency braking (AEB) technology. Ford said it will fit the technology on an updated version of the car available to European customers who order after September. The company said its decision to leave out the automatic emergency braking technology when it launched the Mustang in Europe in 2015 was due to low demand from target customers. The Mustang is a "safe car, meeting or exceeding all applicable safety standards globally," Ford said in a statement. The automaker said the Mustang scored a five-star rating in crash tests carried out by NHTSA (National Highway Traffic Safety Administration) in the U.S.
Euro NCAP also penalized the Mustang for insufficient inflation of the driver and front passenger airbags that caused the crash test dummies' heads to make head contact with the steering wheel and dashboard. Protection for children seated in the back of the car was also criticized. The car scored 32 percent for child occupant protection. Euro NCAP changed the way it scored crash test results to include automatic emergency braking last year, citing research in UK and Germany showing that the technology could prevent one in five fatal pedestrian collisions. Ford said if the Mustang been tested before this new protocol was established, the car would have scored much higher. Euro NCAP scored the Mustang four stars out of five for adult occupant protection. Euro NCAP rarely tests sports cars because of their low volume, preferring to focus on more popular cars. The organization is backed by the European Union and its safety results are closely watched by automakers because they can influence buying decisions.